CHEERS TO CANDLESTICKS - Decor Designs, Inc. Using everyday household items in new and unexpected ways is often a necessary trick of the trade for interior redesigners and decorators alike. If you just can’t find what you have in mind or you don’t have the budget or the time to run out to the store to get that perfect something, you have to make do with what’s on hand. Then again, sometimes you come across things that just beg to be used in a creative, new way. 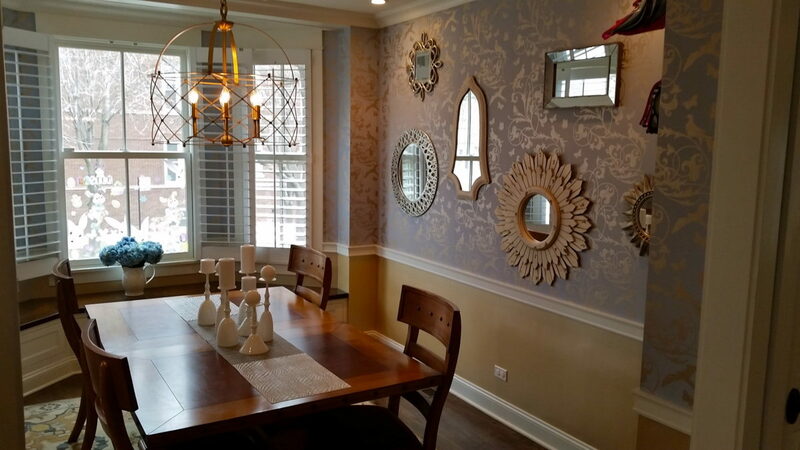 We just finished a job in Chicago where I needed a new statement centerpiece for an already stunning and updated dining room. I wanted something unique and different to match the owner’s personality and taste. I ended up stumbling across these wonderful solid-white wine, champagne and martini glass stems at Z Gallerie that just spoke to me. And while I loved the shapes and sizes, I also loved that they could have a “dual purpose” as candlesticks by simply turning the upside down. 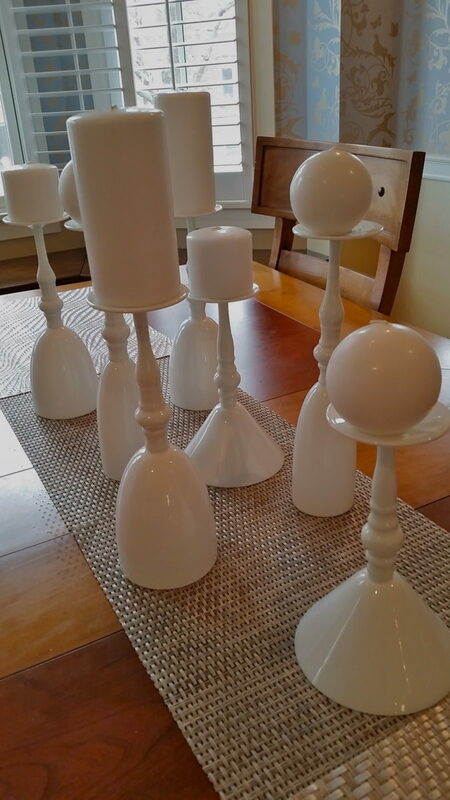 I added matching pure white candles in three different shapes and sizes to vary the height and profile. This simple but out-of-the-box centerpiece looks like something out of a trade magazine and is the kind of idea that even Candice Olson I think would approve. The beautiful thing about this idea is that you could probably go to your wine cabinet or bar right now and find stems that would work just the same. I’d obviously suggest sturdy stems that can handle the weight of the candles. Varying the height and shape of the stems and candles will create flow and visual interest. But you can use the same stems and candles if you want a more symmetrical, uniform look. The wonderful thing about repurposing household items is that when you get tired of them in their new “incarnation”, they can go back to being what they were originally intended to be. So raise a glass to using items in unexpected ways. Can’t find one? Simply turn over a candlestick. Happy Decorating! This entry was posted in Decor Designs, Inc., Decorating Tips, Interior Decorating and tagged Decorating Tips, Interior Redesign on March 20, 2015 by Jeff Rice.